AFP: After nearly three years of devastating war and the big challenge of reconstruction in the country, is it likely that you will not be a candidate for the presidency? 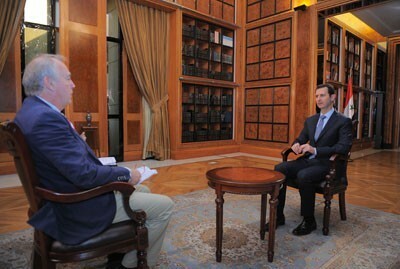 President Assad: This depends on two things: It depends on personal aspirations or a personal decision, on the one hand, and on public opinion in Syria, on the other. As far as I am concerned, I see no reason why I shouldn’t stand; as for Syrian public opinion, there is still around four months before the election date is announced. If in that time, there is public desire and a public opinion in favour of my candidacy, I will not hesitate for a second to run for election. In short, we can say that the chances for my candidacy are significant. AFP: In these past years, have you thought for a moment about losing the battle, and have you thought of an alternative scenario for you and your family? President Assad: In any battle, there is always the possibility of winning and losing; but when you're defending your country, it's obvious that the only choice is to win. Should Syria lose this battle that would mean the spread of chaos throughout the Middle East. This battle is not confined to Syria and is not, as Western propaganda portrays, a popular uprising against a regime suppressing its people and a revolution calling for democracy and freedom. These lies have now become clear to people. A popular revolution doesn’t last for three years only to fail; moreover, a national revolution cannot have a foreign agenda. As for the scenarios that I have considered, of course these types of battles will have numerous scenarios – 1st, 2nd, 3rd……tenth, but they are all focused on defending the country not on running away from it. Fleeing is not an option in these circumstances. I must be at the forefront of those defending this country and this has been the case from day one. AFP: Do you think you are winning this war? President Assad: This war is not mine to win; it's our war as Syrians. I think this war has, if you will, two phases. The first phase, which took the form of plans drawn up at the beginning, was the overthrow of the Syrian state in a matter of weeks or months. Now, three years on, we can safely say that this has failed, and that the Syrian people have won. There were countries that not only wanted to overthrow the state, but that also wanted to partition the country into several ‘mini-states;’ of course this phase failed, and hence the win for the Syrian people. The other phase of the battle is the fight against terrorism, which we are living on a daily basis. As you know, this phase isn’t over yet, so we can't talk about having won before we eliminate the terrorists. What we can say is that we are making progress and moving forward. This doesn't mean that victory is near at hand; these kinds of battles are complicated, difficult and they need a lot of time. However, as I said, and I reiterate, we are making progress, but have not yet achieved a victory. AFP: Returning to Geneva, do you support a call from the conference for all foreign fighters to leave Syria, including Hezbollah? President Assad: Clearly the job of defending Syria is responsibility of the Syrian people, the Syrian institutions, and in particular the Syrian Army. So, there would be no reason for any non-Syrian fighters to get involved had there not been foreign fighters from dozens of countries attacking civilians and Hezbollah especially on the Syrian-Lebanese border. When we talk about fighters leaving Syria, this would need to be part of a larger package that would see all the foreign fighters leave, and for all armed men – including Syrians – to hand over their weapons to the Syrian state, which would consequently achieve stability. So naturally, yes, one element of the solution in Syria – I wouldn’t say the objective – is for all non-Syrian fighters to leave Syria. AFP: In addition to the prisoner exchange and a ceasefire in Aleppo, what initiatives are you ready to present at Geneva II? President Assad: The Syrian initiative was put forward exactly a year ago, in January of last year. It's a complete initiative that covers both political and security aspects and other dimensions that would lead to stability. All of these details are part of the initiative that Syria previously put forward. However, any initiative, whether this one or any other, must be the result of a dialogue between Syrians. The essence of anything that is proposed, whether it's the crisis itself, fighting terrorism, or the future political vision and political system for Syria, requires the approval of Syrians. Our initiative was based on a process to facilitate this dialogue rather than a process to express the government's point of view. It has always been our view that any initiative must be collective and produced by both the political actors in Syria and the Syrian people in general. AFP: The opposition that will participate in Geneva is divided and many factions on the ground don't believe it represents them. If an agreement is reached, how can it be implemented on the ground? President Assad: This is the same question that we are asking as a government: when I negotiate, who am I negotiating with? There are expected to be many sides at Geneva, we don't know yet who will come, but there will be various parties, including the Syrian government. It is clear to everyone that some of the groups, which might attend the conference, didn't exist until very recently; in fact they were created during the crisis by foreign intelligence agencies whether in Qatar, Saudi Arabia, France, the United States or other countries. So when we sit down with these groups, we are in fact negotiating with those countries. So, is it logical that France should be a part of the Syrian solution? Or Qatar, or America, or Saudi Arabia, or Turkey? This doesn't make any sense. Therefore, when we negotiate with these parties, we're in fact negotiating with the countries that are behind them and that support terrorism in Syria. There are other opposition forces in Syria that have a national agenda; these are parties that we can negotiate with. On the issue of the vision for Syria's future, we are open for these parties to participate in governing the Syrian state, in the government and in other institutions. But as I mentioned earlier, anything that is agreed with any party, whether in Geneva or in Syria, must be subject to people's endorsement, through a referendum put to Syrian citizens. AFP: In this context, could the ceasefire agreements that have been started in Moadimiya and Barzeh be an alternative to Geneva? President Assad: The truth is that these initiatives may be more important than Geneva, because the majority of those fighting and carrying out terrorist operations on the ground have no political agenda. Some of them have become professional armed robbers, and others, as you know, are takfiri organisations fighting for an extremist Islamic emirate and things of that kind. Geneva means nothing for these groups. For this reason, the direct action and the models that have been achieved in Moadamiyeh, in Barzeh and other places in Syria has proven to be very effective. 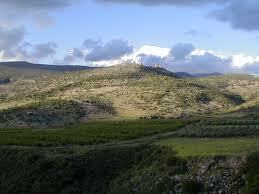 But this is separate from the political process, which is about the political future of Syria. 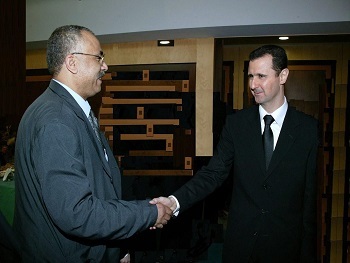 These reconciliations have helped stability and have eased the bloodshed in Syria, both of which help pave the way for the political dialogue I mentioned earlier. AFP: Are you prepared to have a prime minister from the opposition in a future government? President Assad: That depends on who this opposition represents. When it represents a majority, let’s say in parliament, naturally it should lead the government. But to appoint a prime minister from the opposition without having a majority doesn’t make any political sense in any country in the world. In your country, for example, or in Britain or elsewhere, you can’t have a prime minister from a parliamentary minority. This will all depend on the next elections, which we discussed in the Syrian initiative; they will reveal the real size of support for the various opposition forces. As to participation as a principle, we support it, of course it is a good thing. AFP: Are you prepared to have, for example, Ahmed Jarba or Moaz Khatib, be your next prime minister? President Assad: This takes us back to the previous question. Do any of these people represent the Syrian people, or even a portion of the Syrian people? Do they even represent themselves, or are they just representatives of the states that created them? This brings us back to what I mentioned earlier: every one of these groups represents the country that created them. The participation of each of these individuals means the participation of each of those states in the Syrian government! This is the first point. Second, let’s assume that we agreed to the participation of these individuals in the government. Do you think that they would dare to come to Syria to take part in the government? Of course they wouldn’t. Last year, they claimed that they had control of 70% of Syria, yet they didn’t even dare to come to the areas that they had supposed control of. They did come to the border for a 30-minute photo opportunity and then they fled. How can they be ministers in the government? Can a foreigner become a Syrian minister? That’s why these propositions are totally unrealistic, but they do make a good joke! AFP: Mr. President, you said that it depends on the results of the elections, but how can you hold these kinds of elections if part of Syria's territory is in the hands of insurgents? President Assad: During this crisis, and after the unrest started in Syria, we have conducted elections twice: the first was municipal elections and the second was parliamentary elections. Of course, the elections cannot be conducted in the same way they are conducted in normal circumstances, but the roads between Syrian regions are open, and people area able to move freely between different regions. Those who live in difficult areas can go to neighbouring areas and participate in the elections. There will be difficulties, but it is not an impossible process. AFP: Now that opposition fighters are battling jihadists, do you see any difference between the two? President Assad: The answer I would have given you at the beginning of the events or during its various phases, is completely different to the answer today. Today, there are no longer two opposition groups. We all know that during the past few months the extremist terrorist groups fighting in Syria have wiped out the last remaining positions that were held by the forces the West portrays as moderates, calling them the moderate or secular forces, or the Free Syrian Army. These forces no longer exist. We are now dealing with one extremist group made up of various factions. As to the fighters that used to belong to what the West calls ‘moderate forces,’ these have mostly joined these extremist factions, either for fear or voluntarily through financial incentives. In short, regardless of the labels you read in the Western media, we are now fighting one extremist terrorist group comprising of various factions. AFP: Would it be possible for the army and the opposition to fight against the jihadists side by side? President Assad: We cooperate with any party that wants to join the army in fighting terrorists, and this has happened before. There are many militants who have left these organisations and joined the army to fight with it. So this is possible, but these are individual cases. This is not an alliance between ‘moderate’ forces and the army against terrorists. That depiction is false and is an illusion that is used by the West only to justify its support for terrorism in Syria. It supports terrorism under the pretext that it is backing moderation against extremist terrorism, and that is both illogical and false. AFP: The state accuses the rebels of using civilians as human shields in areas under their control, but when the army shells these areas, do you not think this kills innocent people? President Assad: The army does not shell neighbourhoods. The army strikes areas where there are terrorists. 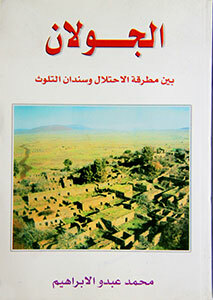 In most cases, terrorists enter particular areas and force out the civilians. Why do you think we have so many displaced people? Most of the millions of displaced people in Syria have fled their homes because terrorists forcefully entered their neighbourhoods. If there are civilians among these armed groups, why do we have so many displaced people? The army is fighting armed terrorists, and in some cases, terrorists have used civilians as human shields. Civilian casualties are unfortunately the consequences of any war. There is no such thing as a clean war in which there are no innocent civilian victims. This is the unfortunate nature of war, and that is why the only solution is to put an end to it. AFP: Mr. President, some international organisations have accused the government and the opposition of committing abuses. After this war ends, would you be ready for there to be an investigation into these abuses? President Assad: There is no logic to this claim made by these organisations. How can the Syrian state be killing its own people, and yet it is still standing three year on, despite the fact that there are dozens of countries working against it. Had the Syrian state been killing its people, they would have revolted against it long ago. Such a state could not survive for more than few months; the fact that it has resisted for three years means that it has popular support. Such talk is more than illogical: it is unnatural. What these organizations are saying is either a reflection of their ignorance of the situation in Syria, or, in some cases, it shows they are following the political agenda of particular states. The Syrian state has always defended its civilians; it is well documented, through all the videos and the photos circulating, that it is the terrorists who are committing massacres and killing civilians everywhere. From the beginning of this crisis, up until today, these organizations do not have a single document to prove that the Syrian government has committed a massacre against civilians anywhere. AFP: Mr. President, we know of foreign journalists who were kidnapped by the terrorist groups. Are there any foreign journalists in state prisons? President Assad: It would be best for you to ask the relevant, specialised agencies on this issue. They would be able to give you an answer. AFP: Would a reconciliation be possible, one day, between Syria on the one hand, and Saudi Arabia, Qatar and Turkey on the other? President Assad: Politics changes constantly, but this change depends on two factors: principles and interests. We share no common principles with the states you mention; these states support terrorism and they have contributed to the bloodshed in Syria. As for interests, we need to ask ourselves: will the Syrian people agree to shared interests with these countries after everything that has happened and all the bloodshed in Syria? I don't want to answer on behalf of the Syrian people. If the people believe they share interests with these states, and if these states change their policy on supporting terrorism, it is plausible that the Syrian people might agree to restore relations. I can’t individually as President, answer on behalf of all the Syrian people at such a time. This is a decision for the people. AFP: Mr. President, you were welcomed on the occasion of July 14 (Bastille Day) in the Elysee Palace in Paris. Are you now surprised by France's position, and do you think France may one day play some kind of role in Syria? 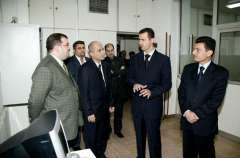 President Assad: No, I am not surprised, because when that reception took place, it was during the period - 2008 to 2011 - where there was a attempt to contain Syria's role and Syria's policy. France was charged with this role by the United States when Sarkozy became president. There was an agreement between France and the Bush administration over this, since France is an old friend of the Arabs and of Syria and as such it is better suited to play the role. 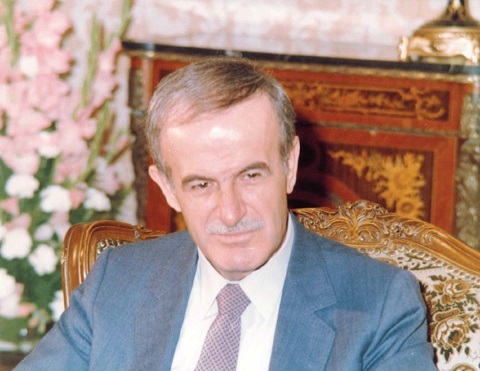 The requirement at that time was to use Syria against Iran and Hezbollah, and to pull it away from supporting resistance organisations in the region. This French policy failed, because its goal was blatantly obvious. Then the so-called Arab Spring began, and France turned against Syria after it had failed to honour the pledge it had made to the United States. This is the reason behind the French position during that period why it changed in 2011. As for France's role in future, let's talk frankly. Ever since 2001 and the terrorist attacks on New York, there has been no European policy-making to speak of (and that's if we don't look back even further to the 1990s). In the West, there is only an American policy, which is implemented by some European countries. This has been the case on all the issues in our region in the past decade. Today, we see the same thing: either European policy is formulated with American blessing, or American policy is adopted by the Europeans as their own. So, I don't believe that Europe, and particularly France, which used to lead the European policy in the past, is capable of playing any role in the future of Syria, or in neighbouring countries. There is another reason too, and that is that Western officials have lost their credibility. They no longer have double standards; they have triple and quadruple standards. They have all kinds of standards for every political situation. They have lost their credibility; they have sold their principles in return for interests, and therefore it is impossible to build a consistent policy with them. Tomorrow, they might do the exact opposite of what they are doing today. Because of this, I don't think that France will play a role in the immediate future, unless it changes its policy completely and from its core and returns to the politically independent state it once was. AFP: How long do you think Syria needs to rid itself completely of its chemical weapons stockpiles? President Assad: This depends on the extent to which the Organisation for the Prohibition of Chemical Weapons (OPCW) will provide Syria with the necessary equipment to carry out the process. So far, the process of making this equipment available has been quite slow. On the other hand, as you know dismantling and neutralizing the chemical materials is not taking place inside Syria nor by the Syrian state. A number of countries in different parts of the world have accepted to carry out that process; some have agreed to deal with the less dangerous materials, whilst others have refused completely. Since, the timeframe is dependent on these two factors - the role of the OPCW and the countries that accept to neutralize the materials on their territories – it is not for Syria to determine a timeframe on this issue. Syria has honoured its part by preparing and collecting data and providing access to inspectors who verified this data and inspected the chemical agents. The rest, as I said, is up to the other parties. AFP: Mr. President, what has changed in your and your family's daily, personal lives? Do your children understand what has happened? Do you talk to them about this? President Assad: There are a few things that haven't changed. I go to work as usual, and we live in the same house as before, and the children go to school; these things haven't changed. On the other hand, there are things which have affected every Syrian household, including mine: the sadness which lives with us every day - all the time, because of what we see and experience, because of the pain, because of the fallen victims everywhere and the destruction of the infrastructure and the economy. This has affected every family in Syria, including my own. There is no doubt that children are affected more deeply than adults in these circumstances. This generation will probably grow up too early and mature much faster as a result of the crisis. There are questions put to you by children about the causes of what’s happening, that you don’t usually deal with in normal circumstances. Why are there such evil people? Why are there victims? It’s not easy to explain these things to children, but they remain persistent daily questions and a subject of discussion in every family, including my own. AFP: Through these years, what was the most difficult situation you went through? President Assad: It’s not necessarily a particular situation but rather group of elements. There are several things that were hard to come to terms with, and they are still difficult. The first, I believe, is terrorism; the degree of savagery and inhumanity that the terrorists have reached reminds us of what happened in the Middle Ages in Europe over 500 years ago. In more recent modern times, it reminds us of the massacres perpetrated by the Ottomans against the Armenians when they killed a million and a half Armenians and half a million Orthodox Syriacs in Syria and in Turkish territory. The other aspect that is difficult to understand is the extent of Western officials' superficiality in their failure to understand what happened in this region, and their subsequent inability to have a vision for the present or for the future. They are always very late in realizing things, sometimes even after the situation has been overtaken by a new reality that is completely different. The third thing that is difficult to understand is the extent of influence of petrodollars in changing roles on the international arena. For instance, how Qatar was transformed from a marginal state to a powerful one, while France has become a proxy state implementing Qatari policies. This is also what we see happening now between France and Saudi Arabia. How can petrodollars make western officials, particularly in France, sell their principles and sell the principles of the French Revolution in return for a few billion dollars? These are only a few things, among others, which are difficult for one to understand and accept. AFP: The trial of those accused of the assassination of former Lebanese Prime Minister Rafic Hariri has begun. Do you think it will be a fair trial? President Assad: Nine years have passed since the beginning of this trial. Has justice been served? Every accusation was made for political reasons. Even in the past few days, we have not seen any tangible proof put forward against the parties involved in the case. The real question should be: why the timing? Why now? This court was set up nine years ago. Have the things produced in the last few days been uncovered only now? 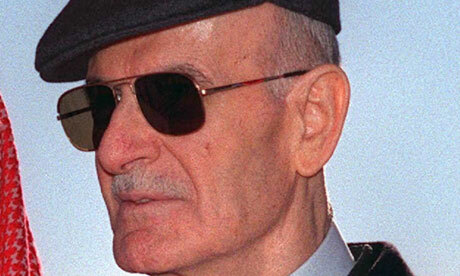 I believe that the whole thing is politicized and is intended to put pressure on Hezbollah in Lebanon in the same way that it aimed at putting pressure on Syria in the beginning, immediately after al-Hariri’s assassination. AFP: You have said the war will end when terrorism is eradicated. But the Syrians and everyone else want to know when this war will end. Within months? After a year? In years to come? President Assad: We hope that the Geneva conference will be able to provide an answer to part of this by exercising pressure on these countries. This aspect has nothing to do with Syria; otherwise we would have put pressure on these states from the beginning and prevented terrorism from entering Syria. From our side, when this terrorism stops coming in, ending the war will not take more than a few months. AFP: It appears Western intelligence agencies want to re-open channels of communication with Damascus, in order to ask you for help fighting terrorism. Are you ready for that? President Assad: There have been meetings with several intelligence agencies from a number of countries. Our response has been that security cooperation cannot be separated from political cooperation, and political cooperation cannot be achieved while these states adopt anti-Syrian policies. This was our answer, brief and clear. AFP: You have said in the past that the state has made mistakes. In your view, what were the mistakes that could have been avoided? President Assad: I have said that mistakes can be made in any situation. I did not specify what those mistakes were because this cannot be done objectively until the crisis is behind us and we can assess our experience. Evaluating them whilst we are in the middle of the crisis will only yield limited results. AFP: Mr. President, without Russia, China and Iran's help, would you have been able to resist in the face of the wars declared against you? President Assad: This is a hypothetical question, which I cannot answer, because we haven’t experienced the alternative. Reality has shown that Russian, Chinese and Iranian support has been important and has contributed to Syria’s steadfastness. Without this support, things probably would have been much more difficult. How? It is difficult to draw a hypothetical picture at this stage. AFP: After all that has happened, can you imagine another president rebuilding Syria? President Assad: If this is what the Syrian people want, I don’t have a problem with it. I am not the kind of person who clings to power. 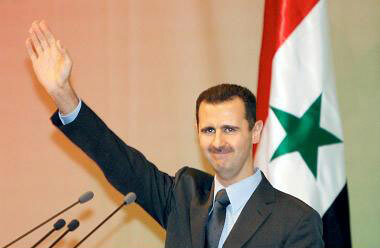 In any case, should the Syrian people not want me to be president, obviously there will be somebody else. I don't have a personal problem with this issue.